Amazing is also often the word used to describe this unexpected piece of paradise. Driving from Okete Road on a metal road, you will be welcomed by native bush, hear the tui's greet you with their song and fan tails darting around you. Sheltered on a private farm, a farm that has links to the original Raglan settlers, this stunning property which has sweeping views of the sea and surrounding rolling hills will let you unwind and relax in this traditional kiwiana Bach. Your own personal jetty at the back door whether to jet ski or have use of the owners Kayak or Canadian canoe to explore the surrounding area. Kayak up the estuary to see the mesmerising Okete waterfall. Flounder is in abundance which you could catch and cook on the same day or try your hand at whitebaiting in season or fishing directly off the wharf. Sit on the deck at night with your favourite glass of wine and take in the wonders of the night sky. No light pollution allowing you to watch shooting stars and satellites orbit above you. This Bach offers an open plan kitchen, stone bench tops alongside an original coal range. The dining and lounge area leads from here on to the deck with expansive sea views which roll in on three sides of the Bach. Two bedrooms, with comfortable mattresses with sink in toppers will allow you to have the relaxation you deserve. A BBQ, plus laundry facilities available. Although the Bach is two story and access is via stairs the self contained lower level still has original dirt floor so not quite the specs guests are looking for these days so no one stays here but people still have fond memories of staying under the bach in a bygone era and have visited to be reminded of their stays here. Beautiful coastal walks or adventures along the beach front and lovely safe swimming at your doorstep or endless fun jumping or fishing from the wharf. The Bach steeped in memories and fun times. Whether it is a romantic getaway or an action packed family holiday there is something here for everyone. Create your own history in this adventure playground. Deck not suitable for small children. 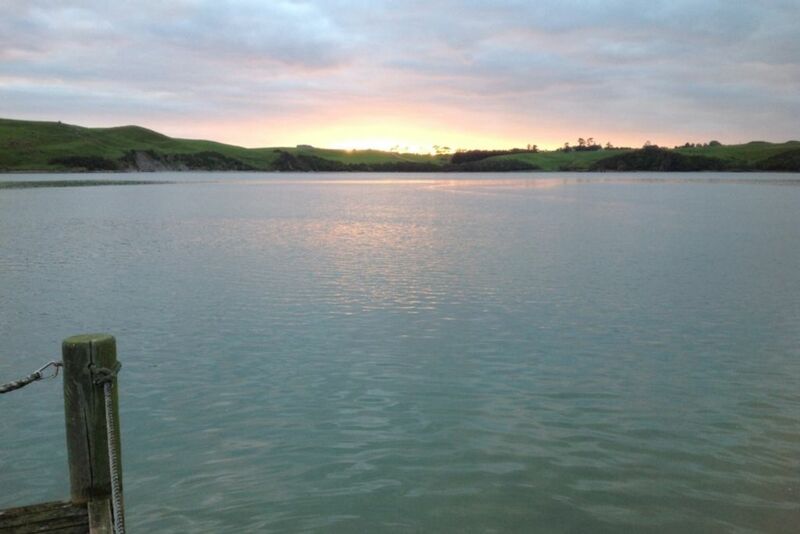 Personal jetty at the back door, (tide dependent) jet ski or try your hand fishing from. Great in every way. Awe inspiring setting watching the tide come in. Traditional bach but modernised and comfortable. Great communication from owner. We loved the authentic interior , high ceilings and great open space inside. Really nice interior finishes and fixings that blend in with the original character of the bach. The views of the water at sunrise and sunset are ridiculously good! My girlfriend caught fish off the jetty at high tide and we both used the free kayaks supplied and kayaked to the Okete waterfall just before dusk which was a highlight of our trip. She enjoyed watching me kayak in a circle until I got the hang of going straight. The exterior didn't bother us at all ... infact we hate cookie cutter design home bachs .... we love character so it was right up our alley. Our only complaint is our weekend wasn't long enough. We look forward to coming back! We really enjoyed our stay, we loved being so close to the water. The batch is situated in a lovely spot. We didn’t want to leave! The batch itself was clean and tidy, modern kitchen and bathroom. It would have been nice to have more than 4 glasses and 4 plates for a family of 5. There is only one kayak and canoe, would have been more enjoyable with more kayaks. Great place for fishing. We really enjoyed our holiday at this Bach. Great spot away from the hustle/bustle of Raglan township. Very quiet, private setting after a drive down a private 1 km road through a farm. Looks very rustic on the outside! But comfortable beds and such a cool space to have a quiet time away. Thanks. Loved this place. Perfect for a getaway from it all. Private, tranquil, great views and comfy and clean inside. Catch a few yellow eyed mullet off the Jetty. Great if you have paddle boards or an inflatable. You get about 5 hours boating, 2 hours either side of high tide. Waterfalls a short paddle away or lie on your own private beach across the harbor. The owner Julie was also lovely to deal with. Thanks for a great holiday - we'll be back.